This will be an easy brunch item if your hubby is wanting to treat you to a Mother’s Day meal. It’s much like a quiche, but with no crust for him to have to fuss with. Grab your big ol' iron skillet, just like Grandma used to use. This recipe is part of our Family Skillet Meals that begins on page 57 of the Trim Healthy Mama Cookbook. Busy week nights can be saved as long as you have some bacon, veggies, and eggs in your house. 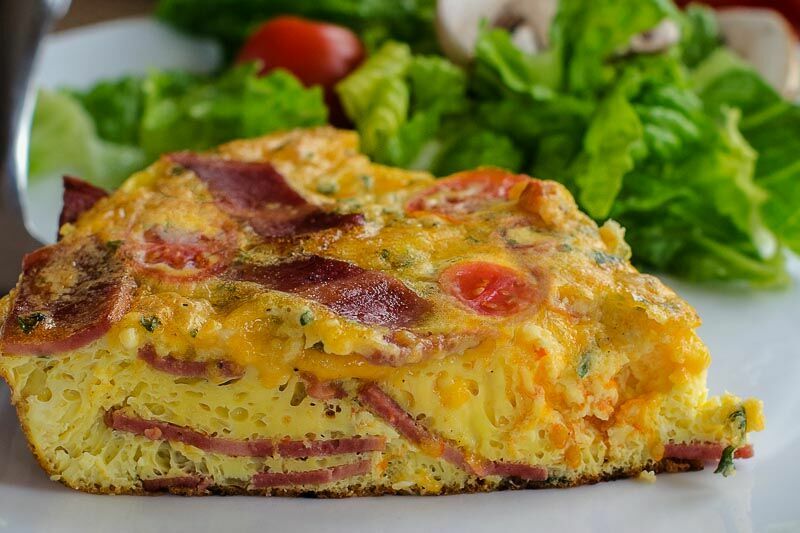 A frittata is basically like a crustless quiche cooked in a skillet then finished in your oven. It’s super quick and inexpensive. You’ll need an oven-safe skillet for this. In this case the BLT of this recipe stands for “ Bacon Loves Tomato". The two really are a perfect match. Pair this frittata with a side salad and you'll have your lettuce, if you’d rather go with the traditional meaning.This basic recipe can be the foundation for your own creation. Once you have your eggs, cheese, and seasonings, use or don’t use the frittata ingredients as you wish—whatever your heart desires. Some additions are spinach, mushrooms, yellow squash, asparagus, or sausage. Preheat the broiler. Cook the bacon pieces in a large oven-safe skillet until slightly crisp (if using pork bacon, drain off most of the grease after cooking), then remove from the heat. Whisk the eggs in a large mixing bowl until light, then add the cheese, tomatoes, and onion (if using). Stir in the salt, pepper, and parsley, and combine well. Pour the egg mixture into the skillet with the bacon, then put the skillet back over medium heat. Cover and cook for about 5 minutes, or until the egg mixture is just setting around the sides. Place the skillet in the oven, uncovered, and broil for 3 to 5 minutes, until lightly browned on top. Keep a good eye on it because these few minutes go fast and you don’t want to end up with a dark brown frittata.